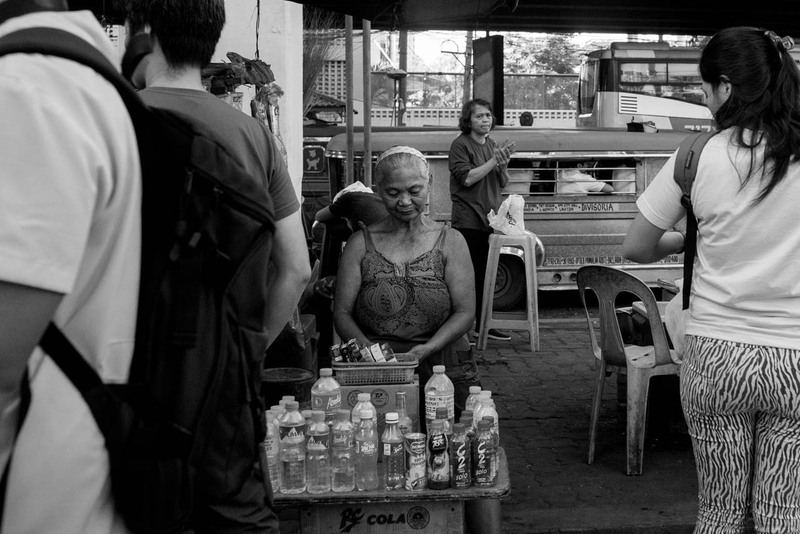 An old woman selling various beverages to people on their way to work in front of Plaza Rueda, Taft Ave., Manila. For the past three days, I’ve been at the hospital attending to a family medical emergency. And every morning, I’d walk into the plaza across the street and would get breakfast while watching people go about the morning rush. I took my camera out on the third day and started shooting. Another old woman, a food vendor, got curious and asked why I was taking photos. I told her, naglilibang lang po, and smiled. She smiled back. I eventually ate breakfast at her stall, one hard-boiled egg and a cup of buko juice. No photos, I just didn’t feel the need to take more photos. See on flickr for EXIF. Filed under Street Photography. Tagged as 35mm, Black and white, Ermita, Leica, Manila, Sony A7SII, Street Photography, Streets of Manila, Summicron.